Back in 2015 we created a game called "Got Rhythm?". You remember, the game where we asked people to tap out a simple beat using a keyboard, mouse, or by tapping the screen of their mobile device. Well holy cow, over 2 million people from across the world have now played the game. But we couldn't stop there. 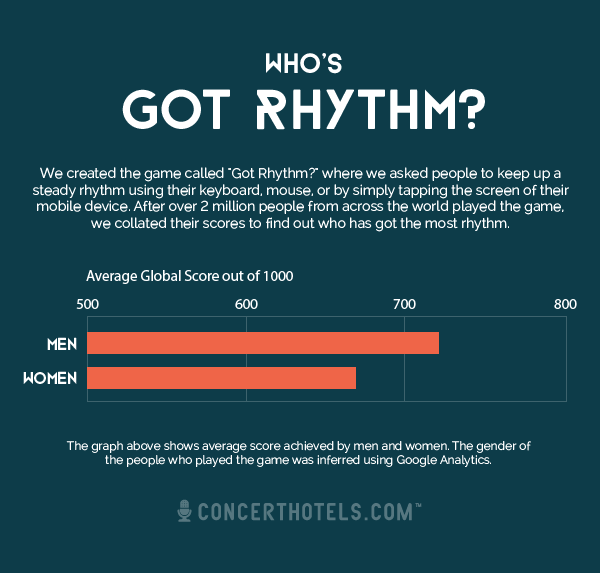 We wanted to know where we could find the most rhythmic people. 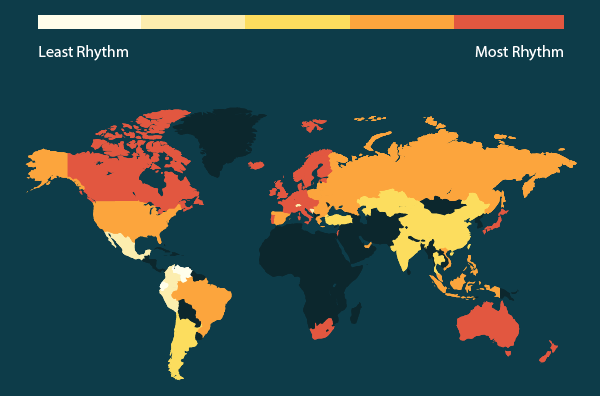 We collated all your scores to find out who in the world has got the most rhythm. Sorry girls, it turns out guys are better at keeping rhythm, or they just spend way more time practicing their drumming skills. The guys average score was over 50 points higher smashing through the 700 point mark. The graph above shows average score achieved by men and women. The gender of the people who played the game was inferred using Google Analytics. Which continent would be the King or Queen of rhythm? When it comes to rhythm we often think of Latin America with dances such as the Argentine Tango, the Salsa, Cha-cha-cha and Mambo. In fact the country with the most rhythm was Slovenia, more famous for wine, bears and one of the world's largest ski jumps. The map above shows average scores of people from 65 countries, as determined by Google Analytics. The number of people who played the game in each country is at least 1,000. Bringing up the bottom of our rhythmic leaderboard, an astounding six South American countries, with Venezuela only just clearing the 500 mark. Maybe we shouldn't worry too much though, it's just a game. 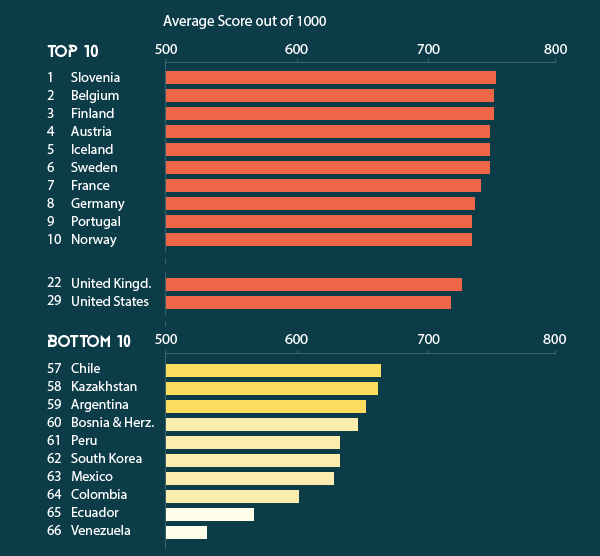 The graph above shows average score achieved by people from a given country, as determined by Google Analytics. The number of people who played the game in each country is at least 1,000. 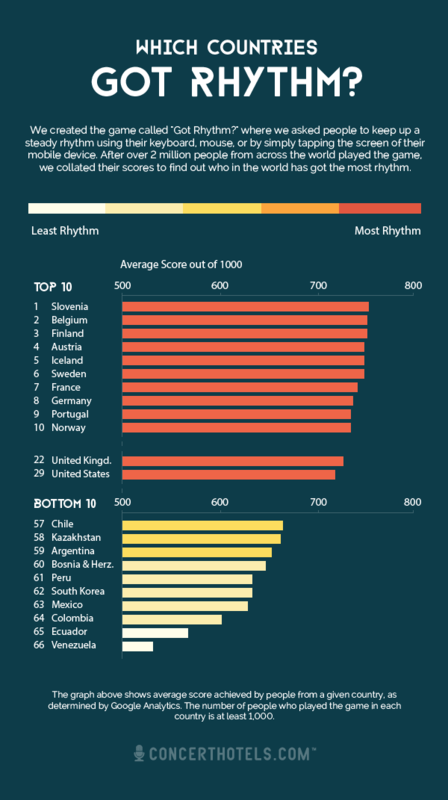 Want to see if you have got more rhythm than Slovenia or Venezuela? Head over to Got Rhythm and tap out a simple beat.